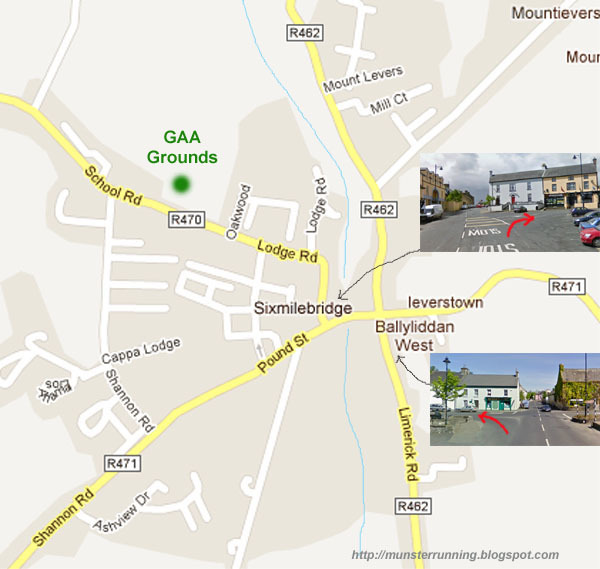 Located in the south of county Clare, Sixmilebridge is within easy reach of Limerick City, Shannon and Ennis.. 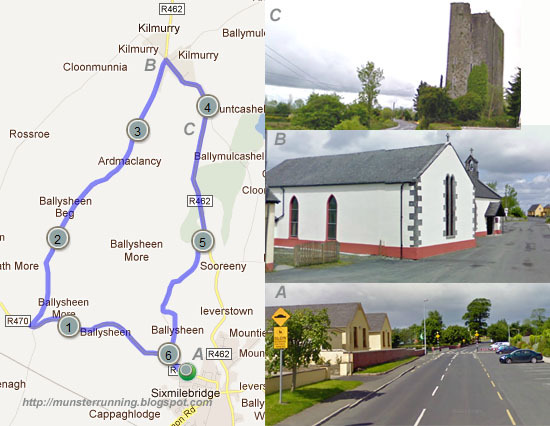 The 10 km course is to the north-west of Sixmilebridge and takes in the village of Kilmurry as well. 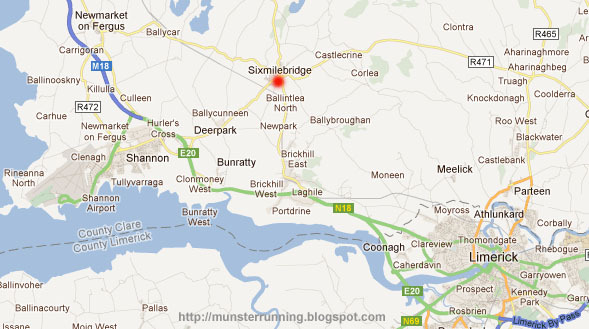 Closer look at the 10 km course...The race starts and finishes just outside the GAA grounds. As you can see from the photo below, it's an uphill start which by the same token means that it is a downhill finish. 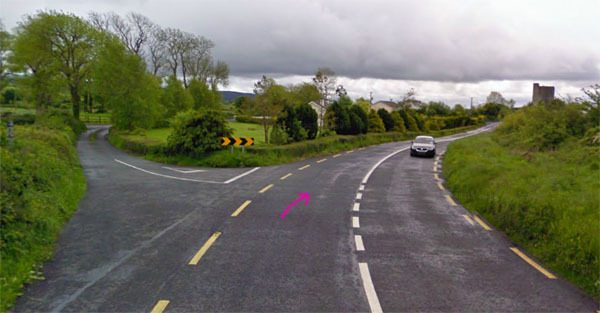 At about 0.2 miles / 300m, the road eases off and you come to the road junction that marks the start of the loop to the north-west. Note that this is a busier road and there is likely to be some traffic present. Up to now, the course has been pretty modest with just some gentle inclines. If you are used to running 10k and above then you should have found the first 3.5 miles reasonably fast. The second half of the course is however quite different. The last mile of the race is pretty tough so you are going to lose time there. If you have a target time in mind then you have to make the most of any downhill running. That's where the next section of road comes in. 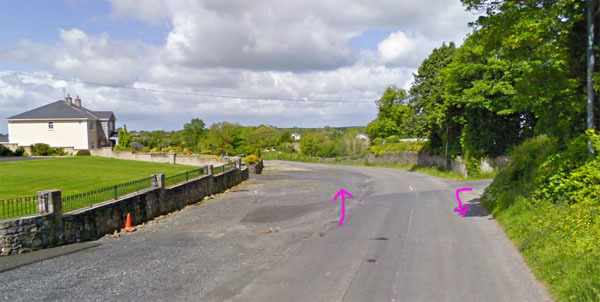 From the road junction above in Kilmurry at around 3.5 miles / 5.6 kms to where the road turns off at around 5 miles / 8 kms, it's a gentle downhill slope. You should try to make the most of this to build up a cushion ahead of the difficult section to come. Mountcashel Castle...built in the second half of the 15th century. So narrow in fact that there is only space for one car at a time. The road rises and it opens up again around the 5.2 mile mark...just one mile now to go to the finish line. When you turn left here, you are just after the 6 mile mark and you have a 300 metre downhill run to the finish line. 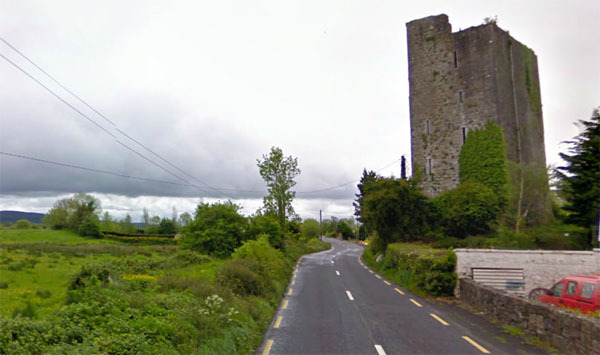 Overall.......10k course on mostly quiet country roads in the south of County Clare. The course is reasonably fast with a challenging last mile. Make the most of any downhill or flat sections.